Always use the proper grade ladder for the job. Always check to make sure there are no electrical lines in the work area. Make sure that the ladder is squarely secured at the bottom and top if necessary. Check and Re-check the set up prior to ascending the ladder. It is too late once you are up on it if there is a faulty set up. Most of us have climbed a ladder at some point. The simplicity of climbing a ladder may conceal the risk associated with using one. You can easily slip, lose your balance, overreach, or fall because you’ve used the wrong ladder. Physical Therapists will tell you that the injuries sustained when someone falls from a ladder can be extremely traumatic. In most cases, more than one body part is involved and in many cases the injuries are severe. Injuries can be life threatening and most certainly are severe enough to limit someone’s function for a long time and possibly permanently. 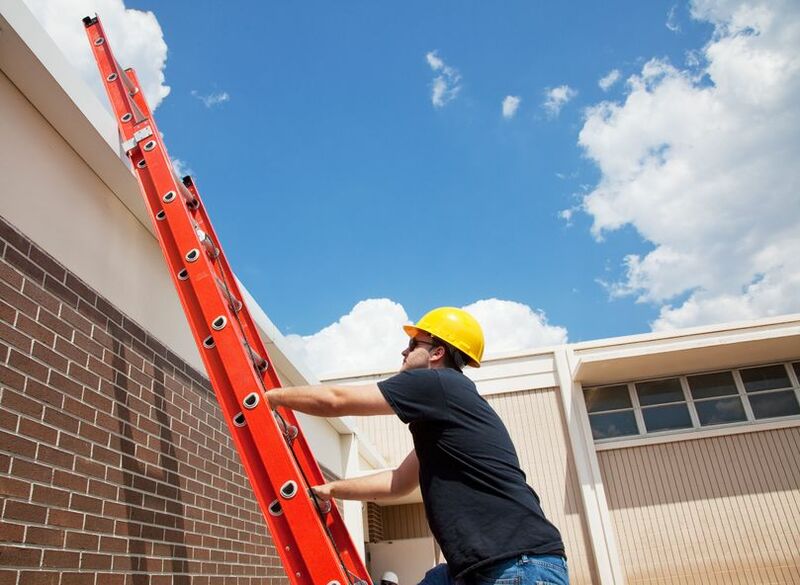 Whenever you use a ladder, you should follow a few ladder safety guidelines to reduce risk of experiencing a severe traumatic event and injury. Today we’ll review ladder safety related to the stepladder and the extension ladder. There are numerous types of ladders that will not be discussed, but every ladder must be respected and nothing taken for granted. Be careful when using any object that will take your feet off of the ground. A stepladder is a four legged, “A” frame, self-supporting ladder. It ranges from 3 to 20 feet tall and has a rating system that must be followed when considering what type is the proper ladder for your job. The rating system classifies the ladders by the amount weight it can support. You must determine how much weight will be on the ladder at any given time. You must consider the weight of the person and any object that they will be handling while on the ladder. Most people who need the use of a stepladder around the house can purchase the Light or Medium duty model with a weight limit between 200 – 225 lbs. If you weigh more than that you must consider the industrial grade of heavy or Extra-heavy duty that can support a maximum of 250 – 300 lbs. Never use a damaged ladder. Never use a ladder that is not the proper grade. Always make sure all 4 legs are squarely supported. 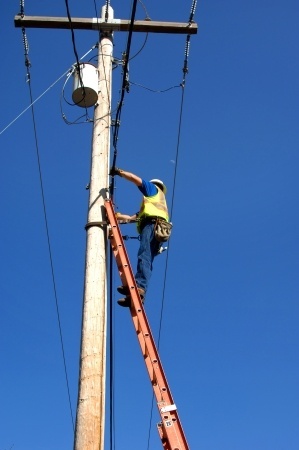 Check for power or electric lines and outputs prior to raising the ladder. Remember the three-point of contact: when on the ladder always have three points of contact (two feet, one hand or two hands, one foot). Always face the ladder and stay in the middle when going up or down. Don’t place the ladder on another object to make it higher and never on a slippery surface. Never stand on the very top or “Top Cap” of the stepladder. Never move the ladder with you or someone else on it. Never use the ladder as a platform. Never lean the stepladder against the wall. The “spreaders” must be extended and locked. An extension ladder is a portable ladder that consists of two sections that fit together and can extend or slide out to a longer length. The top of the ladder leans up against a stationary object and the bottom of the ladder stands on two feet or on supports. Extension ladders are graded based on the amount of weight that will be on the ladder at any one time. This weight must include the person and the object that is being moved up or down the ladder. The rating scale is the same as the Stepladder scale with the Light duty or household ladder being able to support 200 lbs. Based on weight, the grades ascend to a Special Duty Rugged that supports up to 375lbs. Your local hardware store or ladder provider can help you choose the proper graded ladder for your particular needs. Please note: Extension ladders can pose a serious threat to severe injury due the height that you are able to ascend to when the ladder is fully extended. The top of the ladder should extend 1-3 feet above the support point and if needed it should be tied or firmly connected to that area. The base of the ladder should be far enough from the object that the ladder can lean at approximately a 75-degree angle. A quick way to determine this angle is to divide the length of the extended ladder by 4. The distance from the “feet” of the ladder to the wall should be ¼ of the total height of the extension ladder for that particular job (i.e. the ladder is extended to a length/height of 40 feet, (40/4 = 10) the “feet” of the ladder should be placed 10 feet from the wall). Always make sure the two feet and the two rails at the top are squarely set. Never attempt to move the ladder with you or someone else on the ladder. Always check for electrical hazards. Never use as ladder that is not graded for the amount of weight that will be on the ladder. Never place the “feet” of the ladder on another object to make the ladder higher. Never place the “feet” on a slippery surface. Be sure to secure the top rails of the ladder if there is a chance it will move or if you will be getting off of the ladder at the top. Never tie two extension ladders together. Stay in the middle of the ladder. Don’t lean from the middle of the ladder to “reach” an object. Get off and move the ladder. Always extend the ladder 3 feet above the top of the object that it is leaning against. Use a tool belt. Don’t carry tools in your hands. Ladders are a part of life for many people. We use them at home, at work and even in recreational areas. 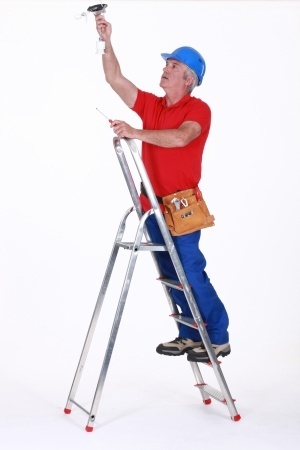 Proper ladder safety can eliminate many of the chances of experiencing a severe and possibly fatal injury. Don’t rush. Use the ladder properly by going through your safety checklist prior to beginning the job. Proper ladder safety can help you avoid spending a very long time rehabilitating an injury(s) with a Physical Therapist.